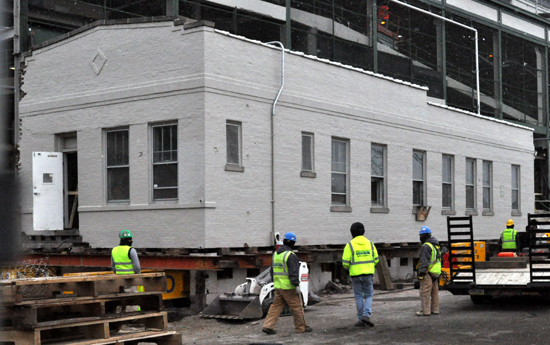 The Chicago Cubs today moved the “caretaker’s house” also known as “Bobby Dorr’s House” which was directly adjacent to northwest side ofWrigley Field. It was built in 1923 for the grounds superintendent. The building looks familiar, but I never really paid any attention to it. I’m sure 99% of Cubs fans have the same experience. It’s going to be “restored”. What does that entail? So basically it’s a new house. But oh, wait, it’s being “restored”. Give me a break. Just say you’re rebuilding the house and it will retain a portion of its original character. This “restore” language is flat out wrong. They could have tore the whole thing down and 99% of Cubs fans would have never noticed the difference. So it’s cool that they want to pay homage to the history of the ballpark, but this most certainly is no restoration project.